ital memo "Pomera DM10", which is neither a PC nor a mobile phone, is a revolutionary business tool which fits the term "unprecedented". It allows users to focus on the memo function by completely removing additional elements and specializing in "taking memo with a keyboard". The start-up time is 2 seconds, the size is compact that one can easily carry around, and the weight is approximately 370 grams. By using a high contrast black and white 4 inch TFT LCD, not only is it easy to read the letters, but it also realizes the long running time (approx. 20 hours) by reducing the battery consumption. Furthermore, not having to save the data every time the power is shut is one of the features worth mentioning. Also, the fact that it can be used alongside a PC with a USB and a micro SD proves the ability to adapt to various scenes and the richness of the spec. 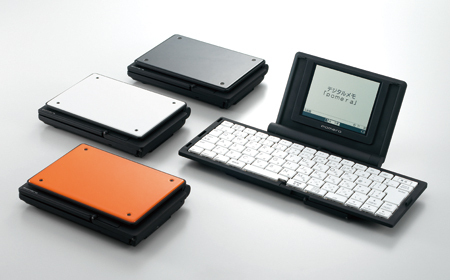 "Pomera", with the functionality and the ease of usage, can also appeal to "writers" who always carry notebook PCs or a paper notebooks. In December 2009, a new model (DM20) was just released with improved functionality and design. Great things can be expected from the future of the product that has established a position in a specialized genre of "digital memo".